Glenn Sudbury came back from a near-no-hitter for Utah in 1990 and pitched an actual no-hitter, The Deseret News wrote. It was a 2-1 victory over New Mexico in April, the only run coming after a lead-off hit-by-pitch. "The defense played really well today. They backed me up and made all the plays they had to. That's all I could ask for," Sudbury told The News afterward. "I had good location with my fastball today and I got my slider working for me." 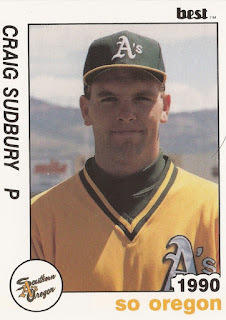 Sudbury went on from Utah to make the pros, taken by the Athletics in the 32nd round of that June's draft. He ended up playing four seasons, but he never made AA. At Utah, Sudbury's 1990 efforts won him All-Conference honors. He also hit some rough spots. By early April, he had 36 strikeouts to 16 walks, but he also had a 7.61 ERA. His coach, though, was confident in Sudbury's abilities. "On a given day, Sudbury will beat anybody in America," Utah coach Rich Sofield told The News. Sudbury's near-no-hitter came soon after, against Hawaii. He went six innings without giving up a hit. He then gave up three. With the Athletics, Sudbury started at short-season Southern Oregon, also getting time that year at high-A Modesto. Between them, he got 14 outings, 11 starts and an ERA of 3.80. In a June game with Southern Oregon, Sudbury went six, while giving up just one run and taking the loss, according to The Spokane Chronicle. Sudbury also won praise from his manager, Grady Fuson. "Sudbury, I thought, was outstanding," Fuson told The Chronicle. Sudbury played 1991 between Modesto and single-A Madison. He went 7-10 over 32 outings, 16 starts. He then played the next two seasons exclusively at Modesto and almost exclusively as a reliever. In 1993, he got into 42 games, with an ERA of 8.27. It was his final year as a pro.